10 years ago on our college budget I slowly one at a time bought the cherry finished Target shelves, 5 of them to be exact and when we moved into our new house I knew right where I wanted them to go...THE CURB. I however am not a wasteful person and I did need shelves for my books so I put them where I knew at some point I would have new fabulous books shelves and swore to myself we would live in the house for 6 months before I did anything to it..the six months has come and gone and I have done a few projects(I will share soon) but our most impactful by far are our new shelves in the family room. Gone are the Target shelves, they were saved from the curb and banished to the basement to hold games and puzzles. This was a process for me. 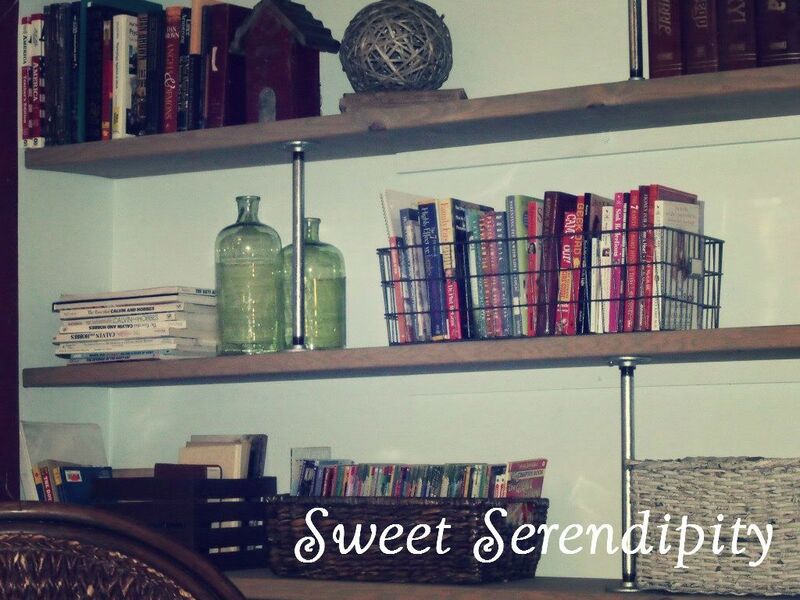 I debated painting the old shelves and adding new backs, I drew several varying shelf plans, wandered the hardware store for inspiration, scoured catalogs, magazines, and blogs and it was Pinterest where I found my final inspiration. 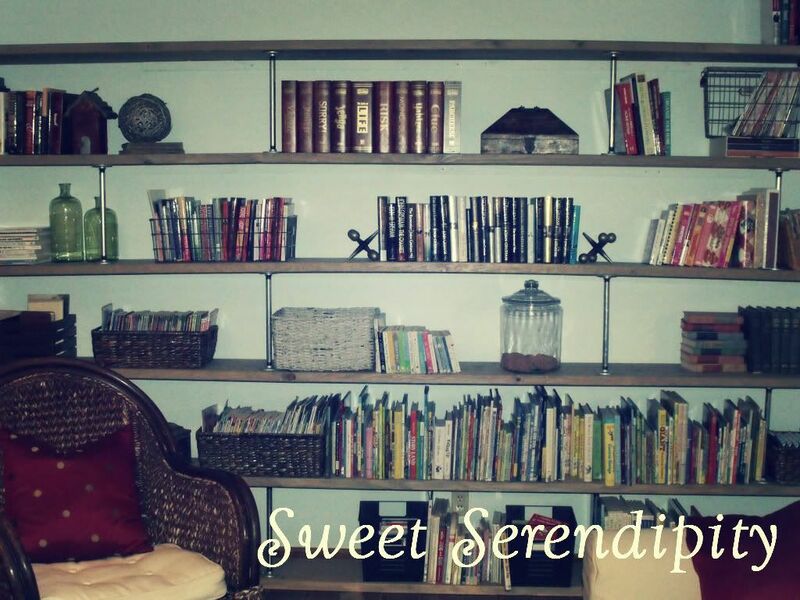 Shannon at Anythingology made these fabulous industrial rustic shelves and then the process began and I tweaked her plans just a bit here and there due to the fact my shelves were going to be huge compared to hers at 149 inches by 96 inches. I would like to add Shannon was quite helpful when I emailed her about her shelves and asked oodles of questions...thank you Shannon! 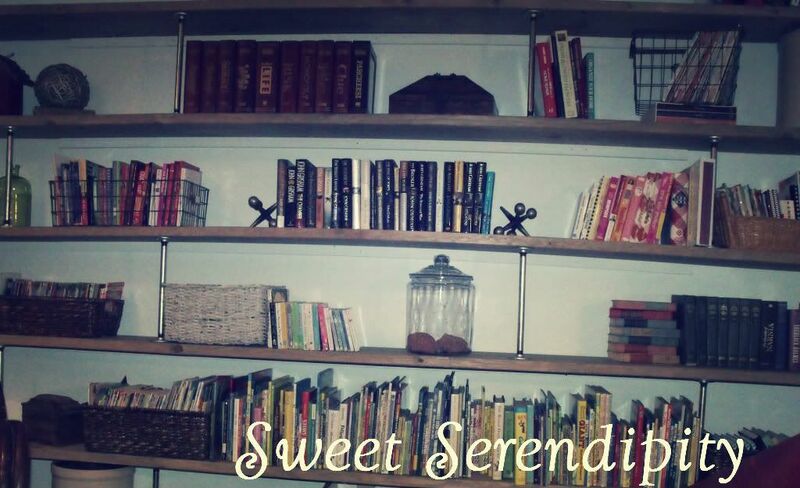 To be honest I did not do anything to make these shelves so I need to give credit to my David for making these for me while I was on bedrest, the best thing is he learned how to stain, so now I will have a staining partner for any new projects on the horizon!!! I honestly LOVE them and have really opened up the room!